Mashed potatoes, freshly carved turkey, and cranberry sauce. Boy was I stuffed after Thanksgiving dinner last week. But my pants weren’t the only thing busting from the seams – so was my inbox. Every year, more and more organizations send out “thank you” emails around Thanksgiving. I got at least four emails with the exact phrase, “we’re thankful for you.” While it’s important to thank your supporters, is there something else you can do to make your organization’s Thanksgiving message stand out? We saw a lot of Thanksgiving emails last week. Most of them were nice – but some of them really caught our attention. Here are the top 4 tactics we saw that had us pondering even when we were down to the leftovers. 1) Don’t just thank your supporters – give them something they’ll appreciate. 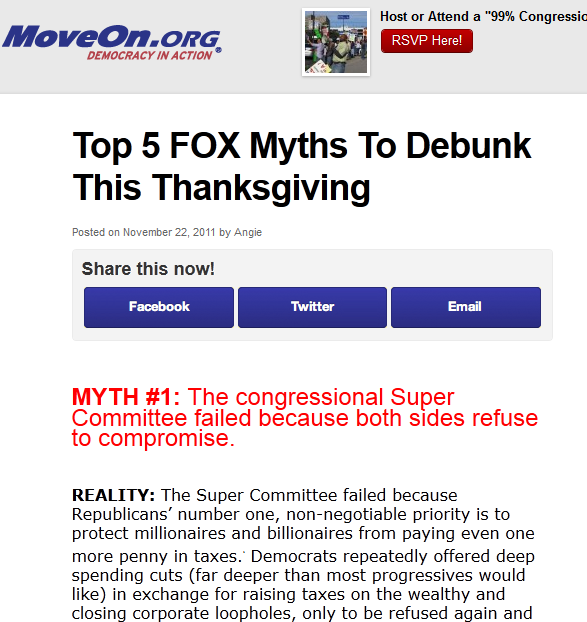 This year, MoveOn didn’t just express their gratitude to supporters… they actually provided something progressives could use during the holiday. Members were sent a short guide to dealing with conservative family members during the holidays, including five conservative myths of the moment and how to debunk them at the dinner table. A mission-centric message that was actually practical! 2) Show your supporters what they have accomplished… and what still lies ahead. 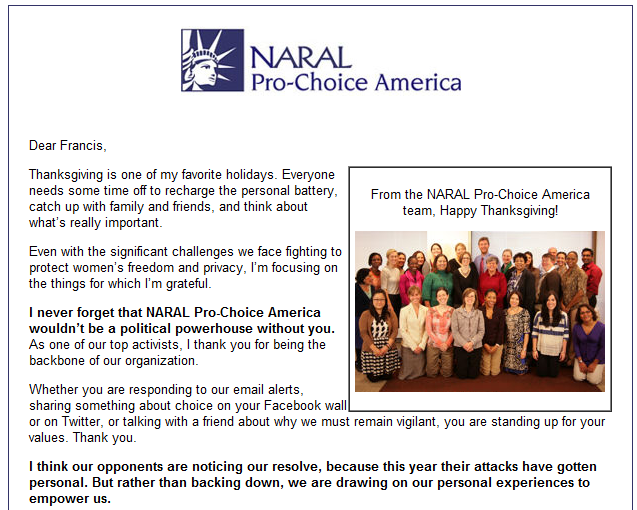 I’ve been a long-time supporter of NARAL Pro-Choice America, and they targeted their Thanksgiving message this year to folks like me. They made me feel proud of my efforts: “As one of our top activists, I thank you for being the backbone of our organization… Whether you are responding to our email alerts, sharing something about choice on your Facebook wall or on Twitter, or talking with a friend about why we must remain vigilant, you are standing up for your values. Thank you.” And they also reminded me about the ongoing attacks on reproductive choice and justice, while reinforcing that I’m part of a community of committed, pro-choice activists. 3) Make it look different and genuine. Organizations try to mix it up with their Thanksgiving emails by sending less text or including a photo of their staff. But sometimes it’s important to go even further and take a step away from your normal message format. This year, the Human Rights Campaign and St. Joseph’s Indian School used some different tactics to help convey their organizations’ sincere gratitude. 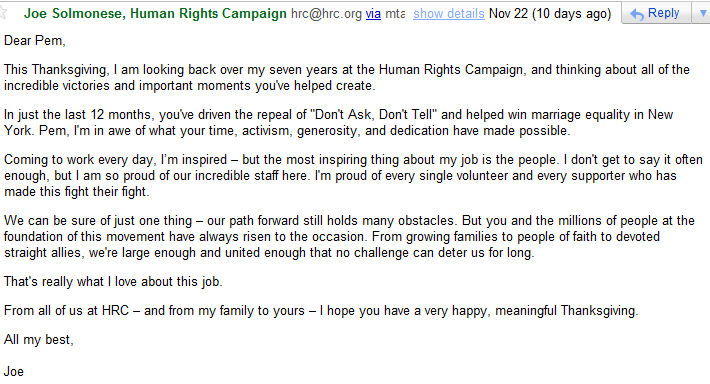 The Human Rights Campaign dropped their logo, HTML formatting, and the callout box and sent something that felt a little more personal from their President, Joe Solmonese. St. Joseph’s Indian School featured a photo of one of their actual students holding up a two-sentence thank you note. 4) Hit me with an emotional gut punch. Okay, GetUp! 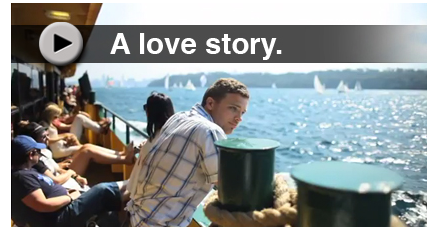 Action for Australia didn’t say their beautiful marriage equality video was for Thanksgiving, but they sure made me feel thankful to live in Massachusetts. And their video didn’t just resonate with me: it generated nearly 3 million views in its first week online. What made it so successful? It told the story of two people who meet, fall in love, move in together, quarrel, experience loss, and then finally get engaged. But only until the very end do you realize that the video is about a gay couple (throughout the video, you only ever see one of the two people – the other is “behind” the camera). The video is a reminder that what really moves us – and motivates us to share content and take action – is not statistics or rational arguments, but stories that resonate with our own experiences and values.